Kimberly Ross joined Michigan Medicine in 2017 as Chief Government Relations Officer. Prior to that, Kim was a lobbyist and policy advisor for Dykema Gossett, PLLC, representing a variety of clients before state legislature, state agencies, and the Governor’s office in multiple policy areas, including health care and Medicare/Medicaid. She has broad experience developing the relationships that are foundational to building successful alliances, partnerships and coalitions across the state. 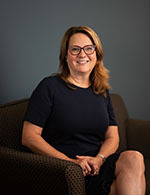 Prior to Dykema Gossett, Kim served as the Director of State Government Relations and Public Affairs at Pfizer, focusing on Michigan and Wisconsin. She is also a University of Michigan graduate, Dearborn campus.